Last autumn, we published the very first DOTC MpS Rising Stars: Constellation 1. A collection of interesting MpS players who brought something good to the Ecosystem. I chose individuals or companies who in my opinion, contributed to the MpS cause in a positive manner. For instance, last year, Constellation 1 included, MT Business Technologies, Ken Stewart, Robert Newry, and Photizo. So how did these stars fare over the past 12 months? Ken Stewart, as Senior Consultant with Photizo, is helping build audacious projects global in scope and transformative in results. Robert Newry/Newfield IT - Being purchased by Xerox sure has it's financial benefits. The doubters and old -skool sayers of nay, express how X will stifle the free expression of ideas. Yet, Robert continues to promote the art of assessments for 8everyone, for all in the MpS ecosystem. Photizo's - Ed and the Gang's reputation continues to grow, around the globe, as THE MpS consultancy. They are moving from a consultancy to a transformation company. MT Business Technologies - Still plugging along, slugging it out in the trenches and barnyards of MpS/SmB in the state that starts with an "O" and ends with an "O". Who will make it this year, and where will the be 12 months from now? I introduce to you, Constellation 2 - The Rising MpS Stars of 2011. Two years of evaluation, at least 6 xerox's and one two day session and finally, I pull the trigger. Preo for all! Behavior Modification/BeMod, is the next evolutionary step in MpS. Or at least in the assessment/review portion of Pure MpS. I know there are a few 'behavior modification' packages out there and they are all good. I give the edge to Preo. I recommend to everyone who is someone in MpS take a strong look at integrating Preo into each and every Assessment. I can hear you now, "Wait. BeMod software in the Assessment? I thought BeMod was an after implementation software package. What does "Rules Based" have to do with assessing end-user behavior BEFORE the engagement?" I find your lack of faith...disturbing, yet I know you'll figure it all out and perhaps someday become one of the BeModSquad(missing Linc and all). I have been looking for a way to work with Doug and Barney for what seems forever - really just a couple of years - I think I found a good reason. It's not the proven infrastructure. It isn't because SNi has been moving cartridges since the very beginning. It isn't even because they flew me out to St. Louis and fed me well in Seattle. It's because they know who they are. They can spot posers in a realm thick with dubious characters - "a fisherman always sees another fisherman from afar". It's because of this edge, this perspective, that SNi can remember then let go of the past. For our past successes hold us back. Times change, and Supplies Network seems to be changing with them. Hush - I know HP is an OEM and manufacturers a bazillion print devices. I know they define "MpS" as "machine placement system". The next 24 months years will be very telling. At the OPS conference in Orlando this month, HP stated that MpS is a "marathon" not a "sprint" - she is wrong. At the OPS conference, HP lauded printing from the cloud, from tablets and 'Droids as the second coming in print - she is wrong. At the OPS conference HP stated that two hour toner delivery, anywhere in the US or the world, will be the next great step in MpS - she is wrong. Yet, there is something about that great, big, blue gorilla - she can't be ignored. And she me be slow to move have blinders on and incorrectly think everyone loves her, she has a plan. It may take a while, but poke a gorilla with a stick for any amount of time, when she turns on you, you're mauled. Go ahead and googlitize "Gorilla Mauling" and see what they go after. HP is huge, number two is behind by a long shot and she has an MpS plan. The channel will get revamped. Direct Sales will be re-tooled for MpS at the Enterprise level. The best of Printillegence will be duplicated, copied, replicated and cloned. How bad can it be? "Collaboration is the new Innovation"
Supplies Network, Preo and HP - "BowChickenWowWow..."
I have been with HP since the Series II. I remember how over the decades the one bane of Mother Blue was the dreaded "third party toner manufacturers" - "Toner Pirates", "drill-n-fill", low-quality, warranty voiding, snake-oil sales people, are just a few of the choice labels spewed out by HP loyalists. Including me. Well, the times they have changed. Last week, in Seattle, I counted no less than 4 HP folks inside a Supplies Network, MpS seminar. Four. From field operatives to transitional change agents. Stunning. For more than two years, I have seen Mike at almost every show - the consummate showman; open, honest, sincere - no snake oil - refreshing. Truth be told, up until the Muratec Conference in Vegas, I really didn't 'see' what MWA did on a daily basis. Machine to Machine (M2M) communication. That means, if your refrigerator has an Intel chip, with MWA magic inside, it will tell your grocery store that you need eggs and tell your toaster that bread is on the way. This is the next move in remote monitoring, remote diagnostics, remote viewing, remote...anything. From the new home thermostats in California, which I am convinced is a commie, mind control plot, to the latest MIB reader, thingies. This company sees the future and is aligned with the top-drawer technology companies - in addition to our industry's leading OEM's. MWA has been a very big supporter of the entire MpS movement recognizing early, it isn't about the 'p', it is about the "M". I see big, shinny-bright balls of fun in MWA's future. Look to them for nifty M2M stuff and track Mike down at the next imaging event you attend. There they are, TheDeathOfTheCopier, 2011, rising stars of MpS . Another year, another four. Curious to know your opinion. "Printer Giants" are re-defining MpS in their own likeness, utilizing the concept as a simple marketing point leveraged to deliver more equipment. The only 'giants' I see are Xerox and HP. 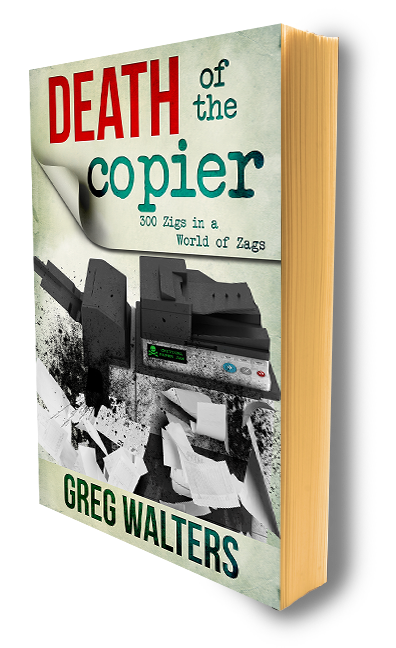 The copier dudes are still pushing it out - Ricoh has the money, the commitment and a plan. They are working it today. Pure MpS looks to reduce the number of prints/MIF...and it is happening. Copier installs have been below 2007 levels since 2007. We will never reach those levels again. For Oki specifically - I reviewed the program 3 years ago. It was adequate. The marketing pieces are really good, I just looked. But I don't know too many people actually using it. No worries. I am sure it is very good, today. I see Oki going after the VAR channel for partners and SMB/SOHO at the customer level. Not a bad plan, I question the overall sustainability in a niche that is dwindling. Thank you very much for reading DOTC and keep coming back. Thanks for your response. Having used MPS programs, I seem to be surprised how businesses are still abstaining from the benefits and cost-effectiveness of the same. I have to agree with you that HP which is a printer giant is re-defining MpS in their own likeness. The company is really utilizing the concept as a simple marketing point leveraged to deliver more equipment.